I love the side dishes served for Thanksgiving better the turkey. Yep, I’m the one who piles on the stuffing, scoops up the sweet potatoes, and gets the greediest portion of green beans. For me turkey is better the next day in sandwiches, casseroles, or chopped up and cooked into soups. This is one meal where excess is truly acceptable, and when my family cooks Thanksgiving dinner we have at least 6 side dishes, sometimes 10 or 12! 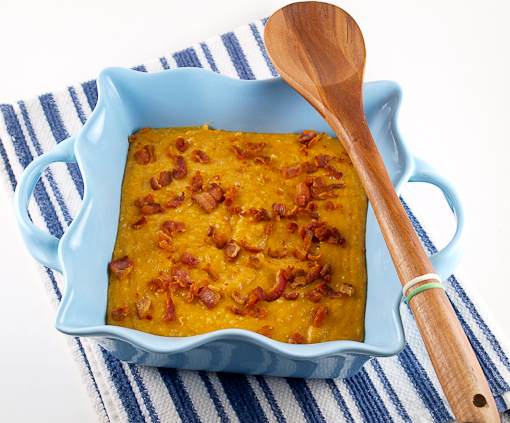 This year I wanted to come up with something that included pumpkin in a savory side dish. Growing up the only time we ate pumpkin was in either pie or quick bread form. We never had pumpkin in a savory way. 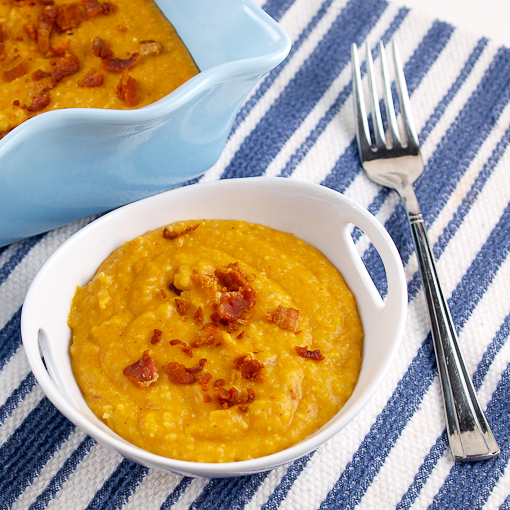 I began eating savory pumpkin dishes a few years ago around the holidays and I just love them. Pumpkin is mild, slightly sweet, and perfect for adding to all kinds of dishes. As Turkey Day side dishes go, this one is spectacular! It is rich, creamy, hearty, and perfect served with roasted poultry. I kept the spices subtle as not to overpower the mild pumpkin flavor, but you could add a few pinches of cinnamon or even cayenne pepper if you wanted for a little extra spicy intensity. The key here is the cream cheese. It adds a little tang to this dish as well as providing that ultra creamy finish on the palate. 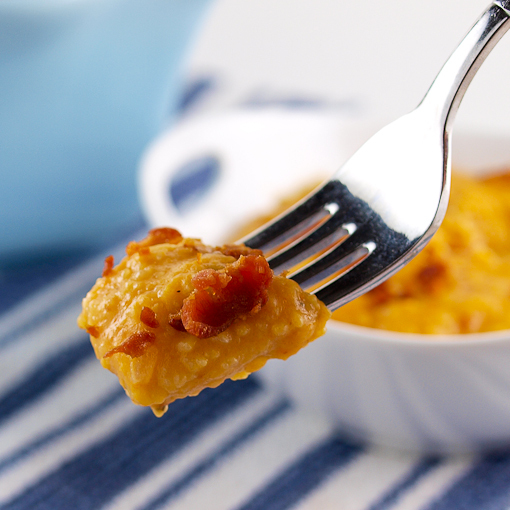 The crisp bacon, used as a garnish, also adds a little texture. I am a big fan of texture. If you wanted you could use this as a vehicle for serving roast beef, chicken, or even left over turkey. Heck, you could even eat this as a main dish all on its own. 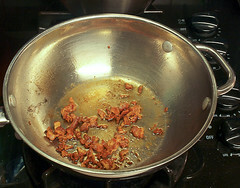 In a medium sauce pan over medium heat cook the bacon until it is crisp. Remove the bacon from the pan and do not drain the fat. Still over medium heat add the butter to the reserved bacon fat. 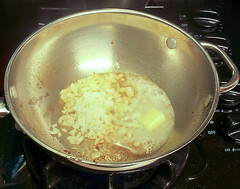 Once the butter melts and starts to foam add the onion and cook until softened, about 2 minutes. Add the garlic, red pepper flakes, salt, and nutmeg and cook until fragrant, about 1 minute. 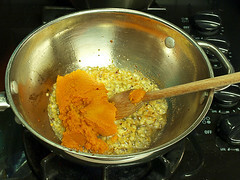 Add the pumpkin puree and cook, stirring constantly, until slightly darker in color, about 3 minutes. 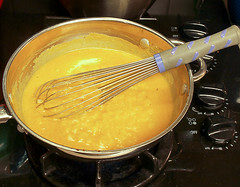 Whisk in the milk and chicken broth and once it comes to a boil slowly whisk in the polenta. 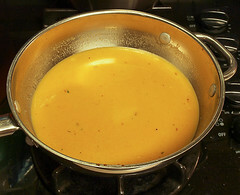 Cook, stirring constantly, for 6 to 8 minutes, or until the polenta thickens. If the polentas seems stiff add a little more milk. Reduce the heat to medium low. 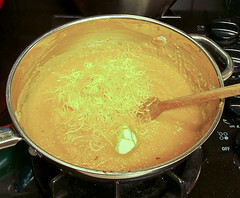 Stir in the shredded cheese and cream cheese until thoroughly melted. 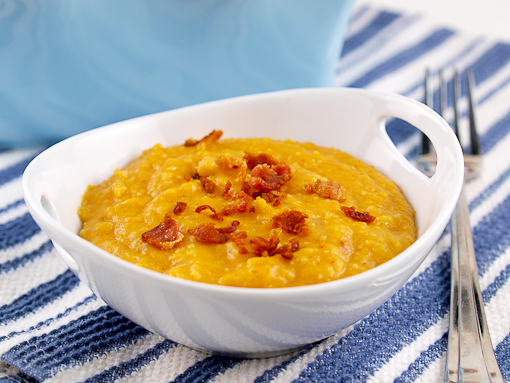 Pour the polenta into a serving dish and garnish with the crisp bacon. Serve hot.